Having friends who love food AND who love making food has revolutionized my life. At least once a month I share a recipe or have one sent my way. Then we go out, create little masterpieces and enjoy the fruits of our labors together. It sounds really corny, but I love it! Greta (check out her Pinterest account for more inspiration) showed me a churro cupcake recipe that made my mouth water just looking at the photos. And she happened to send it in time for my roommate’s birthday. SOLD! This one was an absolute winner – all 18 cupcakes were gone in the first hours of the birthday party. Cha-ching! Preheat the oven to 350 degrees F. Line a muffin pan with cupcake liners; set aside. In a medium bowl, combine the flour, cinnamon, baking powder, and salt; set aside. In a large bowl, or the bowl of a standing mixer, cream the butter and sugar together until light and fluffy. Add the eggs, one at a time, until just combined then stir in the vanilla and oil. Sprinkle 1/3 of the flour mixture over the butter mixture and gently stir in until barely combined. Add half of the milk, mixing until just combined. Repeat these steps with the remaining flour mixture and milk, ending with the flour. Do not over-mix. Fill each cupcake tin with 2 tablespoons of batter, or until the cupcake tin is filled half way (do NOT be generous). Bake the cupcakes for 14 to 16 minutes, or until a toothpick inserted in the center comes out with one or two crumbs clinging to it. Allow the cupcakes to cool completely before frosting. For the frosting: Cream the butter and cream cheese together in a large bowl. Add the sugar, one cup at a time, beating well between each addition. Stir in the cinnamon until thoroughly combined. Then stir in the vanilla. Beat the mixture well, until light and fluffy. Pipe onto cupcakes, sprinkle with a little cinnamon sugar and top with a drizzle of Dulce De Leche if desired. NOW, here is where it gets interesting. I went to the store to get dulce de leche. I’ve bought it before, and actually fell in love with it when I lived in Chile (it tastes AMAZING over plain yogurt and cut-up fruit!). But my local grocery store was charging $5 per can for the stuff, and I COULDN’T DO IT. Side note: sometimes I am thrifty-to-the-point-of-cheap. So instead, I made caramel sauce for the first time. It took two tries, and I might have ruined a pot in the process. Or part of a pot. In any case, if you want to try it, the recipe is right here, and it was pretty easy (as long as you don't let the sugar burn). 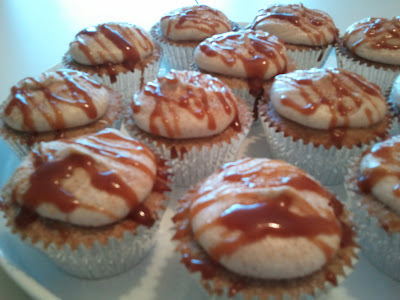 It was also incredibly satisfying to tell everyone that I made the cupcakes, icing AND caramel sauce from scratch. Go on and dust your shoulders off, ladies! Recommended for: a fancy-schmancy treat on a budget, any Latin-themed party, or that time you really want all the credit (and a delicious dessert to boot). Goes especially well with Mexican hot chocolate and coffee! I'm not normally a cupcake fan, but I think I could be converted with this one. That looks so good. I've tried making carmel sauce before and I burned the sugar all three times. After that, I gave up and bought some. Congrats on your success. Oh dear God what are you doing to me at 8:30 on a Monday morning?! This recipe is BOOKMARKED, sister. Holy goodness! You should open a cupcake shop! 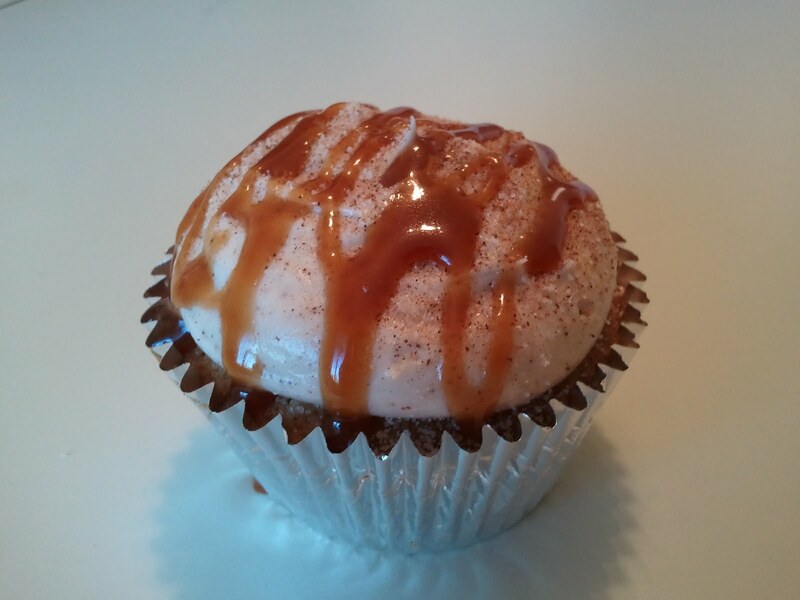 This would make a great treat for surviving the first day of school! These sound, and look, absolutely delicious. Okay, I'm making these soon. I need an excuse. Hmm ... first day of school treats? thanks for sharing! I will have to make these! Wow, these look amazing. I've only had one churro in my life (I'm from the east coast) but I will definitely be making these sometime soon. Thanks for the recipe!